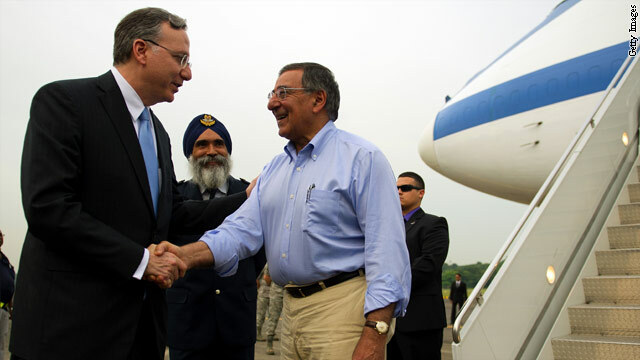 Panetta shakes hands with US Ambassador to Singapore David Adelman upon his arrival to Singapore on Friday. As images of grisly massacres continue to flow from Syrian opposition groups, U.S. Defense Secretary Leon Panetta said the United States should not move forward with unilateral military action without the authorization of the United Nations. "No, I cannot envision that," Panetta said when asked if the United States would bypass the world body to take action in Syria to remove President Bashar al-Assad. But he left the door open by saying, "I think it is important for the U.S. to protect every possible option for taking action in the future." His comments were made Thursday aboard a U.S. Air Force plane taking him to a conference in Asia. At the conference, he is expected to promote the new U.S. military strategy that puts the Defense Department's main focus on Asia, instead of the Middle East and Southwest Asia, where the country has been fighting for over 10 years. "There is no question that we are very concerned about the atrocities that are taking place in Syria," Panetta said. "... This is an intolerable situation. We cannot be satisfied with what's going on and the international community has got to take further steps to make sure that Assad steps down." For the United States, he said, additional steps means "to continue to put pressure on Russia to do what it can to achieve that goal. It means continuing to explore every other possible option here to try to continue the effort to get Assad to step down." Panetta echoed earlier comments he and others in the Obama administration have made that the international community must work together to pressure the Syrian leadership to step down. "I think it's very important right now that we work with the international community because we share the same goals and concerns here," he said. "My hope would be the international community becomes much more aggressive at deciding what additional steps are necessary here." Asked if other countries in the region could be dragged into the Syrian conflict if the fighting drags on, starting a sectarian proxy war, Panetta said he has some concerns. "There are countries like Iran and others (that) are already involved that are trying to assist Assad and there are other groups, both good and bad, that are engaged," he said. "The longer this goes on, the greater the threat the situation is going to get worse in terms of what happens ultimately when Assad steps down. I think the key right now is to have an effective transition and doing it in a way that continues to provide stability for Syria." DUMB DUMb DUmb Dumb dumb DUMMY! Sorry, I swallowed the word "ask", and this forum has no edit" button." Better stay the hell out of this or we might be fighting russia and china next. I doubt that you may end up fighting Russia or China over Syria, but a loss of few bomber planes or a few Navy ships is theoretically possible: unlike Iraq and Afghanistan, Syria was not seasoned by international UN sanctions for the last 15 to 20 years. Also a likely outcome of US invasion is a long lasting scenario with US marines busy going door-to-door and kicking out doors while trying to catch suspected terrorist who multiply like rabbits. And in the end, two presidents later, a less than glorious withdrawal under a newly invented political formula "look, al Qaeda people are not too bad in the end, we can negotiate with them". Sounds familiar, right? Taliban used to be a mortal enemy of the United States back in 2001. And now? Yes, we can negotiate with them, and Mulla Omar is a reasonable intelligent person. And even Muqtada al Sadr is not too bad. no other nation has the capability to do it! america must kill to stop further killings! Why would the US want that? The US wants regime change and the killings are probably orchestrated by the US to achieve this goal. You have been watching too many Hollywood movies recently. Brave superheroes can do every mission impossible like a cake walk. Looks like real-life marines are not so invincible. Yes, you can bomb a third-world African country is impunity for a month or two, provided that it was prepared to be bombed for ten years by international sanctions and arms embargoes, however, after three month you kind of feel running out of cruise missiles (Boeing and Raytheon are happy because new orders to replenish will follow). But achieving a meaningful outcome in another thing. And in doing so you have failed in the past and will always fail again, no matter how much bombing you have done, or going to do. I am deadly curious to hear Wolfowitz and Rumsfeld testifying whether they truly believed in the "cake walk" they said they expected in Iraq, or they were deliberately lying back then in 2003. Capability, yes. Desire/will. hell no! These are Arabs resolving sectarian / tribal / clan political differences in their traditional manner ... by killing each other. For which side shall we weigh in; which side has attacked us? For whom shall we risk our blood and spend our treasure? I VOTE FOR NON-INTERFERENCE but I'm rooting for Assad. His coalition has protected Syria's Christian minority. Arab Spring has proven to be a winter for all but the majority Muslim sect of the country where it has occurred; they pursue religious hegemony, not freedom, We owe their "struggling masses of hypocrites" NOTHING, no blood, no treasure, no intervention! If they want "freedom," let THEM bleed for it; we bled for ours. and why the hell would the US want to help them.It was only a couple of years ago that the syrian people were marching down the street screaming death to American and burning the US flag.Same with yemen and alot of those now startving islamic african countries.so they run the US down,scream for their deaths and yet now they stand there and ask for the US to come help them?If i was the US,id tell the lot of them to ask allah for help.where is their almight god when they are all being killed and starving to death? the US should just halt all foreign aid to countries who speak ill of them.dont matter who,continue to trade as usual but when it comes to saving their hypocrital lives they should say no.let the islamic arab and african worlds start taking life a little more serious.start living in this world rather than this imagined one you have planned for the next life because we the world are gettin a little sick of being threatened and attacked only to see them asking for help ten minutes later. The Syrians don't appear to be asking for intervention. It's primarily the US and Europe that appears to want it. Are you starting to believing the propaganda machine of the west? Apparently we aren't reading the same news articles.